Where ni are any integers and ai are known as the primitive vectors which lie in various directions and extends the lattice. In geometry and crystallography, this particular lattice is generally an infinite array of discrete points that are generated by another set of discrete translation operations as described in the above formula. A translation is overall defined as a rigid motion. It is also a function that moves every point a constant distance in a specified direction. The discrete set of vectors must be closed under vector addition and subtraction. For any value of R, the lattice appears identical. Crystals have a periodic arrangement of one or more atoms that are repeated at each lattice point. A crystal lattice is formed when each point that represents one or more atoms are connected by lines. Due to this reason, the crystal when visualized from any of the lattice points appears the same. There are possibly 14 Bravias lattices that are mainly present in three-dimensional space. In 1850, Auguste Bravais, a French scientist showed that only these 14 forms of unit cells of the lattice entirely matched with the orderly arrangements of atoms in crystals. 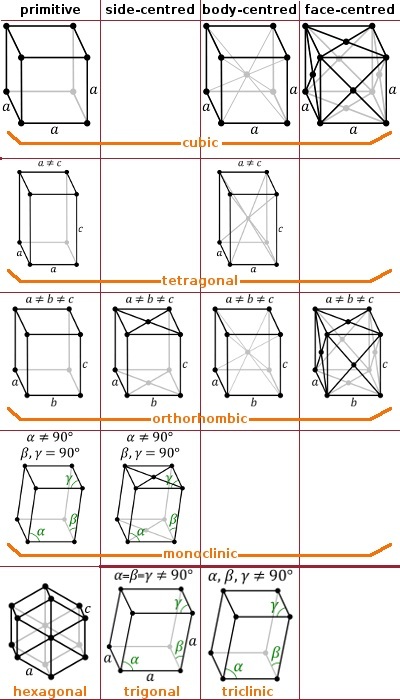 Isometric, orthorhombic, monoclinic, tetragonal, triclinic, and hexagonal are the various forms of a lattice or crystal system. There are five types of lattices in two dimensions where the least symmetric Bravias lattice is the oblique lattice. If the angle between the two lattice vectors is 90◦, it gives rise to a higher symmetry of the cell that can either be a rectangle or square. 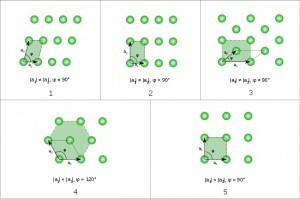 However, it depends whether the unit cell vectors have same or different lengths. The rectangular lattice in turn can be classified into a primitive rectangular lattice and a centred rectangular lattice (rhombic) having an extra lattice point or atom at the centre. The lattice vectors with same length and forming an angle of 120◦ give rise to a highly symmetrical hexagonal lattice. Base centered (A, B or C): Additional lattice point is present at the center of each of one pair of the cell faces. Primitive centering (P): Lattice points are present only on the cell corners. Face centered (F): In this type, one additional lattice point is located at the center of each of the faces of the cell. Body centered (I): One extra lattice point is present at the center of the cell. Totally, there are exactly 7 x 6 = 42 combinations where most of them are identical. Monoclinic I lattice can be described by a monoclinic C lattice by taking different types of crystal axes. 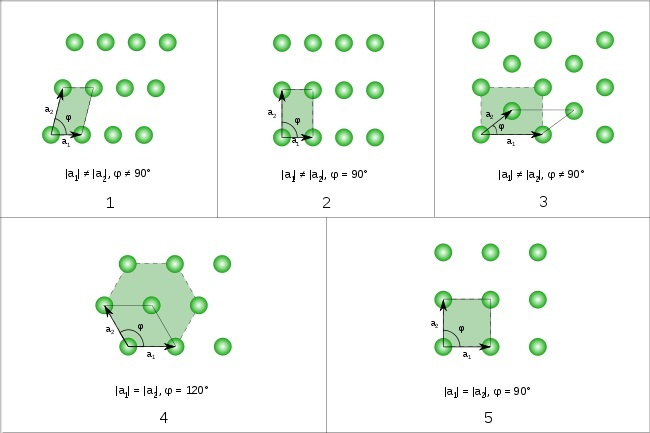 In a similar manner, all A- or B-centered lattices C can be demonstrated either by a C- or P- centering. 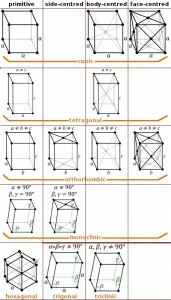 Thus, the 14 Bravias lattices can be viewed from the table given below. There are 64 Bravais lattices in four dimensions out of which 23 are primitive and 41 are centered. 10 of these lattices are split into enantiomorphic pairs.